Ever since people got used to doing everything online, it’s become normal for people to hold meetings and conferences while traveling and within the comforts of their own homes. They no longer have to travel hours just to make it to an important gathering to get work done - all they need is a laptop, a decent internet connection, and the right tools. In many cases, these meetings can be held with nothing but a smartphone. This kind of setup really makes meetings more convenient for everyone. Everyone is sure to arrive on time and, with the right software, the discussion becomes even more dynamic. 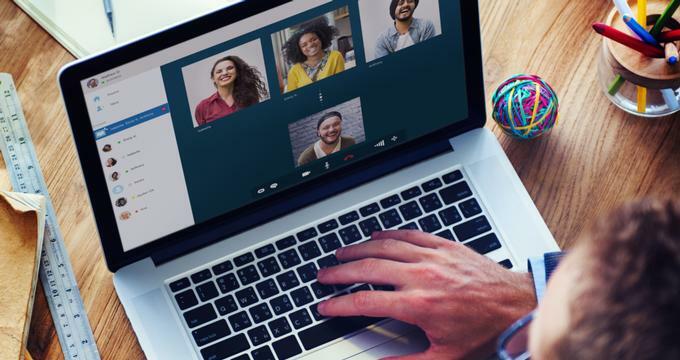 There are many different types of virtual meeting tools out there, some of them are more cost efficient than others, while others offer more features for an added price. Some, still, are absolutely free. These tools will not only allow you to hold all your meetings and conferences online, but also help improve the overall productivity of your business. If you’re looking for a solution to your virtual meeting needs, then you’re going to want to take a good look at this least. You’re sure to find one that will work perfectly for you. Known as one of the best tools for virtual meeting, ezTalks Cloud Meeting is often used by business between small to medium sizes. The tool allows you to switch between your desktop and mobile devices quite smoothly, decreasing downtime with your work. The tool is also appreciated for its crystal clear sound quality as well as high quality videos, both of which are necessary for a successful virtual meeting. ezTalks Cloud Meeting comes with a host of features that would make life easier for you during your meeting. It’s got screen sharing, whiteboard sharing, as well as private and group chatting. You can also schedule as many meetings as you want with this tool for free. There’s also a paid version of the tool, which gives users access to improved features for only $12 per month. Hangouts is Google’s take on what it means to have a virtual meeting. It was designed by the company to help you start and facilitate meetings in different ways, depending on what you preferred (i.e. voice chat, text, and conference calls). The app is very friendly to smartphones and other mobile devices, meaning your meetings are more likely to happen no matter where your friends are. All this is for free, but if you need additional functions, such as being able to record the meetings, make video calls, activate intelligent muting, share screens, do instant messaging, have group conferencing, or even be able to work across multiple devices, you’re going to have to pay $5 per month. These are pretty helpful functions, though, and are definitely worth the cost. ReadyTalk presents itself as the solution for all kinds of conference meetings online. They provide technical assistance while giving you or your attendees control over the meeting. ReadyTalk also allows the creation of polls as well as supports all kinds of conferencing, from mobile to video conferencing. ReadyTalk provides instant tech support as well as group discussions, private chats, video chat, and chatting with up to 100 participants in a group. You can also stream videos for the group. ReadyTalk also integrates with Salesforce, Marketo, Lync, Google Calendar, and Outlook. All these features are arguably worth the cost of $24 per month. Featuring a collaborative whiteboard, multiple monitors, and different views for video streaming, Zoom is known for having unique features that can be quite helpful for any virtual meeting. The app has a free version as well as a paid one that costs $10 per month. The app supports mobile use as well. Zoom also lets users send group texts, hold as many meetings as they want, make as many private calls as they want, and share screens via desktop and mobile. It also supports video streaming, image and audio sharing, and joining meetings via WiFi and cellular data. Join.me is an app that’s used for virtual meetings all over the world in more than 40 countries. The popularity of the virtual meeting app is all thanks to its wide selection of advanced features. The app is also very easy to use and allows you to quickly connect with the people who will join the meeting. Plus, you can customize the meeting venue with the help of screen backdrops and some custom URLs. Participants can also join the meeting from the device of their choice. Join.me’s key features include meeting recording, files transfer, instant screen sharing, cloud storage, host changing, and supporting multiple meetings with as much as 250 participants. The app has both free and paid versions for clients to consider. Among the apps on the list, GoToMeeting is definitely one you would consider more expensive compared to all others. The app gives toll-free numbers and assists users with their control settings. It also lets you change hosts. GoToMeeting is supported for both desktop and mobile. The app will cost around $39 per month, and includes the following key features: screen sharing, meeting with up to 100 participants, HD-quality video streaming, control transfer, whiteboard, and personal URL meetings. Yet another pricey option to consider, Onstream charges its users about $49 per month. With this, users can edit meeting recordings and be able to download them into a video file. It enables file sharing with either all or some select participants. In addition, you can set the files to be downloadable by anyone after the meeting. Of course, the app also has key features such as being able to share screens, create polls, collaborate via whiteboard, and more. If you pay more, you get to enjoy even more features. In spite of the last two apps mentioned, keep in mind that you don’t have to spend too much in order to be able to host a typical virtual meeting with your friends or workmates. But if you think you’ll need the added functions, then paying for extra features might be worth it. Always work with what’s convenient, useful, and within your budget.